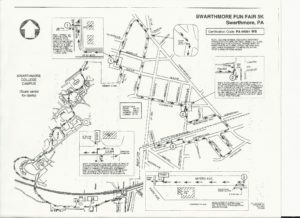 The 16h annual Swarthmore Charity Fun-Fair 5K Run and Walk, sponsored by The Swarthmore Lions Club and supported by the Swarthmore Rotary Club, will be held at 12 noon. The race route goes through the beautiful Swarthmore College campus and the tree-lined streets and neighborhoods of Swarthmore. The run kicks off the Swarthmore Charity Fun-Fair which features a parade, live entertainment on multiple stages, kids’ activities, and plenty of great food. Awards will be presented to the first three male and female runners and to the first three male and female runners in 8 age groups as follows, 10 and under, 11-13, 14-19, 20-29, 30-39, 40-49, 50-59, 60 and above. Refreshments will be served after the race. The entry fee for both the race and the walk is $25 and $30 on race day. On-line registration is available at www.runtheday.com. Registration forms are available in Swarthmore at the Swarthmore Co-op and Borough Hall, in Newtown Square at The Running Place; and at other area running stores. Registration and race packet pick-up will be held at the Swarthmore Septa Train Station on Chester Rd beginning at 10:30am. For more information, contact Jim Ryan at (610) 909-3127 or jdryan17@gmail.com.